I think it is useful to examine the various 12th generation, rack-mounted server models available from Dell, comparing them from a SQL Server perspective. There are currently seven models in this line, ranging from an entry-level, single-socket server to a four-socket server. All of these servers use the Intel Xeon E5 processor (Sandy Bridge), but different models use different series of that processor family, which is a very important detail to pay attention to for SQL Server 2012 usage. You could easily compare the available server models from another vendor in the same way, and I will probably do that in a future post. This model server has a 1U form factor, one processor socket, and uses the Intel Xeon E5-2400 series processor. It has six memory slots (96GB total RAM with 16GB DIMMs), has eight 2.5 inch drive bays, and has one PCI-E 3.0 x8 and one PCI-E 3.0 x16 expansion slots. It has a total of four, six, or eight physical cores for SQL Server 2012 core licensing purposes. It has a total of eight, twelve, or sixteen logical cores with Intel hyper-threading enabled. The R320 is an interesting option for some smaller workloads, since it uses the Xeon E5-2400 series Sandy Bridge-EN processor (that is usually used in two-socket systems) instead of the Xeon E3-1200 Sandy Bridge or Xeon E3-1200 v2 series Ivy Bridge processor that is used in most new single-socket servers. This lets you use up to 96GB of RAM instead of being limited to 32GB of RAM, and it lets you have up to eight physical processor cores instead of being limited to four physical processor cores. The downside of this is being limited to slower processor clock speeds with the E5-2400 series compared to the E3-1200 series processors, which means you will see slower single-threaded performance. The R320 might be a good choice for a DW type of workload, where the extra processor cores and higher memory capacity would be more useful. A single-socket server with an Intel E3-1200 v2 series processor would be better for a small OLTP workload. Keep in mind that SQL Server 2012 Standard Edition is limited to 64GB of RAM. This model server has a 1U form factor, two processor sockets, and uses Intel Xeon E5-2400 series processors. It also has twelve memory slots (192GB total RAM with 16GB DIMMs), has eight 2.5 inch drive bays, and has two PCI-E 3.0 x16 expansion slots. It has a total of eight, twelve, or sixteen physical cores for SQL Server 2012 core licensing purposes. It has a total of sixteen, 24, or 32 logical cores with Intel hyper-threading enabled. This model is a bad choice for SQL Server 2012. The Xeon E5-2400 series Sandy Bridge-EN processor is very limited compared to the Xeon E5-2600 series Sandy Bridge-EP processor. It has slower clock speeds, less memory bandwidth, and less memory capacity. Since you pay the same amount for each SQL Server 2012 core license regardless of what type of physical core is in the processor, the E5-2400 series is a bad choice compared to the E5-2600 series. Another problem with this model server is the fact that it only has two PCI-E expansion slots and eight internal drive bays, which limits your overall I/O capacity and performance. This model server has a 2U form factor, two processor sockets, and uses Intel Xeon E5-2400 series processors. It also has twelve memory slots (192GB total RAM with 16GB DIMMs), has eight 3.5 inch drive bays, and has three PCI-E 3.0 x8 and one PCI-E 3.0 x16 expansion slots. It has a total of eight, twelve, or sixteen physical cores for SQL Server 2012 core licensing purposes. It has a total of sixteen, 24, or 32 logical cores with Intel hyper-threading enabled. This model is also a bad choice for SQL Server 2012 since it uses the same Intel Xeon E5-2400 series processor as the R420 . It does have four PCI-E expansion slots, which is a little better for I/O capacity and performance. Still, I would steer clear of both the R420 and R520 models for SQL Server 2012 usage. This model server has a 1U form factor, two processor sockets, and uses Intel Xeon E5-2600 series processors. It has 24 memory slots (384GB total RAM with 16GB DIMMs), has ten 2.5 inch drive bays, and has one PCI-E 3.0 x8 and two PCI-E 3.0 x16 expansion slots. It also has a total of eight, twelve, or sixteen physical cores for SQL Server 2012 core licensing purposes. It has a total of sixteen, 24, or 32 logical cores with Intel hyper-threading enabled. The R620 is a much better choice for SQL Server 2012 than either the R420 or R520 since it uses the Intel Xeon E5-2600 series Sandy Bridge-EP processor. That processor series gives you higher clock speeds, higher memory bandwidth, and higher memory capacity compared to the Xeon E5-2400 series Sandy Bridge-EN processor. The R620 is limited to three PCI-E expansion slots, but it does have ten internal drive bays. Overall, it is a good model for use as an entry level two-socket database server, especially if you want a 1U form factor. This model server has a 2U form factor, two processor sockets, and uses Intel Xeon E5-2600 series processors. It has 24 memory slots (384GB total RAM with 16GB DIMMs), has sixteen 2.5 inch drive bays, and has six PCI-E 3.0 x8 and one PCI-E 3.0 x16 expansion slots. It has a total of eight, twelve, or sixteen physical cores for SQL Server 2012 core licensing purposes. Total of sixteen, 24, or 32 logical cores with Intel hyper-threading enabled. The R720 is one of my favorite models in the Dell 12th generation line. It uses the same Intel Xeon E5-2600 series processor as the R620, but it has seven PCI-E expansion slots and sixteen internal drive bays, which combine to give you a lot of potential I/O capacity and performance. It does cost a little bit more than the R620, and it is in a 2U vertical size, so there are some scenarios where I would prefer an R620. An example scenario would be an OLTP workload where I knew that I would have external SAN storage with very good random I/O performance, and I wanted to be able to use 1U database servers instead of 2U database servers. This model server has a 2U form factor, two processor sockets, uses Intel Xeon E5-2600 series processors, has 24 memory slots (384GB total RAM with 16GB DIMMs), has 26 2.5 inch drive bays, and has four PCI-E 3.0 x8 and two PCI-E 3.0 x16 expansion slots. Has a total of eight, twelve, or sixteen physical cores for SQL Server 2012 core licensing purposes. Total of sixteen, 24, or 32 logical cores with Intel hyper-threading enabled. The R720xd is similar to the R720, except that it has 26 internal drive bays and only six PCI-E expansion slots. This model could be a good choice if you can run your I/O workload on 26 internal drive bays, some or all of which could be solid state drives (SSDs). This could let you avoid the expense of an external direct-attached storage (DAS) enclosure or a storage area network (SAN). This model server has a 2U form factor, four processor sockets, and uses Intel Xeon E5-4600 series processors. It has 48 memory slots (768GB total RAM with 16GB DIMMs), has sixteen 2.5 inch drive bays, and has five PCI-E 3.0 x8 and two PCI-E 3.0 x16 expansion slots. It also has a total of sixteen, 24, or 32 physical cores for SQL Server 2012 core licensing purposes. Total of 32, 48, or 64 logical cores with Intel hyper-threading enabled. The R820 has four processor sockets in a 2U vertical size. It uses the Intel Xeon E5-4600 series processor, which has lower clock speeds than the Xeon E5-2600 series. There is also some non-uniform memory access (NUMA) scaling loss as you move from a two-socket to a four-socket server, i.e. a four socket server does not have twice the scalability as a two socket server with the exact same processor. The R820 does have sixteen internal drive bays and seven PCI-E expansion slots, so it has good I/O capacity and performance potential. It also has twice the total RAM capacity compared to an R620, R720, or R720xd. In spite of all these factors, I would tend to prefer two R720xd servers instead of one R820 server, assuming you can split your workload between two servers. You would have faster, less expensive processors, over three times as many internal drive bays, and nearly twice as many PCI-E expansion slots, while paying the same SQL Server 2012 license costs. I really like the R720xd, with its 26 internal drive bays. I suspect that a very high percentage of SQL Server workloads would run extremely well on an R720xd. If 26 internal drives did not give you enough I/O performance and capacity, you could always add some internal solid state storage cards or use some form of external storage. As a database professional, I would be actively lobbying against using the R420 or R520 models, since they have the entry-level Intel Xeon E5-2400 series processors, which have lower clock speeds and less memory bandwidth compared to the Intel Xeon E5-2600 series processors that are used in the R620, R720, and R720xd. They also have half of the total memory capacity and far fewer PCI-E slots compared to the higher end models. They are a little less expensive, but the hardware cost delta is very small compared to the SQL Server 2012 license costs. Remember, you are paying for SQL Server 2012 core licenses based on physical core counts, so you want to get the best package you can as far as the rest of the server goes. 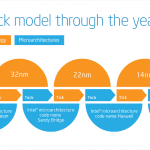 One nice fact is that the Intel Xeon E5 processor family is available in four-core, six-core, and eight core models, with specific four-core models having higher base clock speeds than the “top-of-the line” eight-core model processor. If you wanted to minimize your SQL Server 2012 core-based licensing costs and were willing to give up some scalability and capacity, you could pick one of these faster base clock speed four-core model processors for your server and actually see very good single-threaded performance. A good example of a fast, quad-core Intel Xeon E5 processor is the Intel Xeon E5-2643 that runs at a base clock speed of 3.3GHz, with a Turbo Boost speed of 3.5GHz. This processor would give very good OLTP performance at 50% the SQL Server 2012 Core license cost of an eight-core Intel Xeon E5-2690 that runs at a base clock speed of 2.9GHz, with a Turbo Boost speed of 3.8GHz.